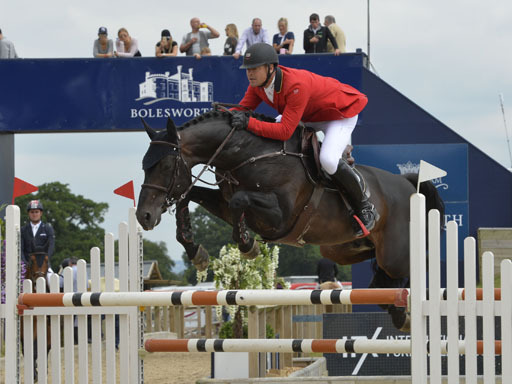 Belgium’s Francois Mathy Jr marked his debut appearance at the Bolesworth CSI **** International with an impressive victory on Saturday. Riding the stallion Diddo van sint Maarden, Mathy took the Young Horse Handicap Final for six and seven-year-old horses, sponsored by Whitley Neill Gin, in stylish fashion. 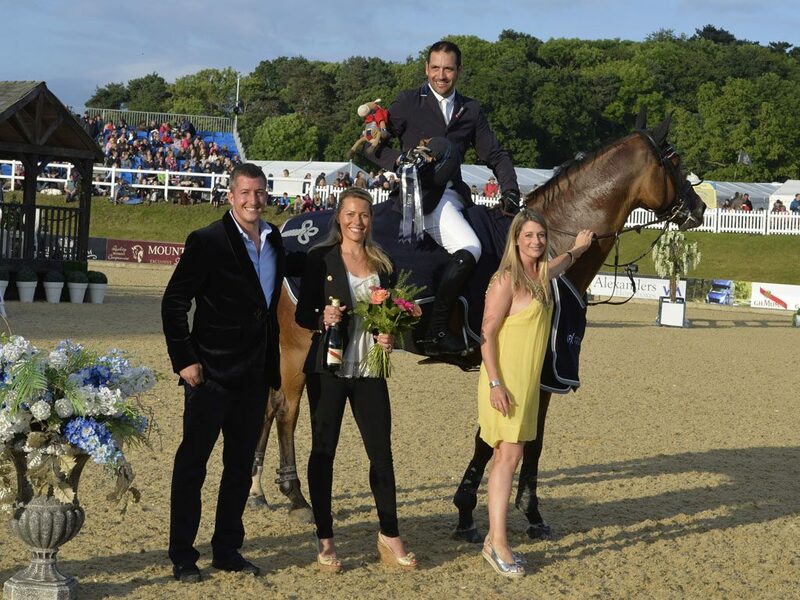 Their jump-off time of 31.42 seconds thwarted the Czech Republic’s Emma Augier de Moussac’s bid for a third Bolesworth victory in 48 hours on Brighton Bay, as she finished second, with Italy’s Luca Maria Moneta third aboard Ambramarie Del Beiro. 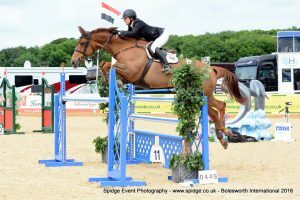 Mathy said: “It is my first time at Bolesworth International, and I was delighted with the horse. “He is a stallion that we bought as a foal. He is owned by Team Harmony, and as a seven-year-old is still a young horse, but has a great brain, is very attentive and always listens. “He coped well with a tight turn from fences one to two, and when I asked him again at the double, he was sharp and quick. The plan is to develop him slowly in young horse classes and let him progress steadily without pushing him. “We based him at the Newmarket stables from a three to six-year-old, and he was well educated, so had a good start. Mischa Irving made the long journey from Lanarkshire in Scotland worthwile when she won Saturday’s International Arena opener – the Am-B accumulator, sponsored by Alexanders Horseboxes. The class ssees riders collect points for fences jumped , with a maximum score of 65, with competitors on that score then separated by time. And it was Irving who dominated the field, clocking a time of 51.49 seconds with eight-year-old Casaretta to triumph by a clear margin from Jule Slade and the ultra-consistent Billy Gogo, with Saudi Arabia’s Sheikh Samir Mirdad third on Mirdad’s Maaa Shaaa Allah. “It was an excellent to the day – I wasn’t expecting that,” Irving said. “I’ve had the horse since a four-year-old and produced her ourselves. She was placed in the amateur class here last year, so we decided to bring her back. 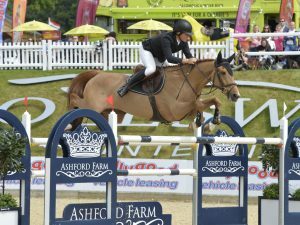 Theo Simpson hailed the quality of his winning ride Touch of Chilli after they made their mark in glorious sunshine at the Bolesworth CSI **** International on Saturday. The two-star grand prix, sponsored by Ashford Farm, saw 13 combinations contest the jump-off, and it was the 12-year-old chestnut mare that came out on top. A time of 41.89 seconds meant they took the £6,400 first prize in comprehensive fashiom with Anna Wilks – an experienced and successful eventer – finishing second aboard Undicci, with Ireland’s David Quigley third on EIS Isaura. “I am over the moon,” Simpson said. “The horse has been on great form, having been second about a month ago in a two-star grand prix. “It was a tough enough track out there, and he performed when he needed to, so I am really happy. “I have had the horse for two years now. I got him two months before I finished my A levels, and he has really been going amazingly during the past few months. We’ve really gelled. And for Quigley, it was another day that showcased Isaura’s rich promise. Early in the day, Emily Ward and Doobally won the two-star jump-off class, sponsored by Gain Horse Feeds, clocking a time of 33.79 seconds , while Sophie Fawcett continued her impressive Bolesworth form by taking second aboard Quite Cadiz, with David McPherson (Sirocco) third and Chloe Breen (Zidane VIII) fourth. 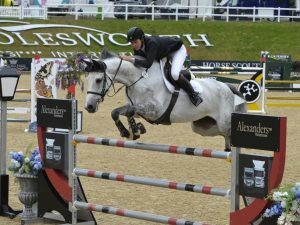 Marion Hughes became the latest two-time winner at the 2016 Bolesworth CSI **** International when she claimed a thrilling victory in the four-star two phase competition, sponsored by Horse & Hound. Irish challenger Hughes had already showcased the talent of Heritage HHS Fortuna by dominating a speed class on Thursday, and with time again of the essence, they did not disappoint. They raced to victory in a time of 22.89 seconds, with the top four finishers separated by just 84 hundredths of a second. Z) fourth and Emma Augier de Moussac (Copia) fifth. “I thought it would be seven strides to the second last fence in the jump-off, but she got there on six, so that was obviously key,” Hughes said. “It was only a short jump-off course, but it was very twisting and turning, and she had a great shot to the last fence. “My mare is very fast, and the ground is super. Conditions are perfect – the warm-up is perfect – and the jumping is great. Nobody can complain. Hannah Francis was in the hearts and minds of everyone at Bolesworth CSI **** International on Saturday evening. Teenager Hannah, an event rider, is battling a rare and aggressive form of bone cancer, but her spirit and courage has inspired the world of equestrian sport. She set up a registered charity called Hannah’s Willberry Wonder Pony to raise funds for research and treatment of bone cancers, and it has so far raised a substantal six-figure amount. 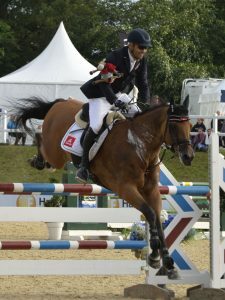 Riding with Besberry – the showjumping equivalent of the Willberry teddy horse – on his arm, Jay Halim won the invitational knockout class, sponsored by IFX International Foreign Exchange. Jay then announced that he would be donating half his prize money to the Willberry charity, and that gesture was matched by Bolesworth show president Nina Barbour. “It is a great charity,” Jay said.